George Stephenson is considered to be the inventor of the first steam locomotive engine for railways. Richard Trevithick's invention is considered the first tramway locomotive, however, it was a road locomotive, designed for a road and not for a railroad. Stephenson was extremely poor growing up and received little formal education. He worked in local collieries and was self-taught in reading and writing. In 1812, he became a colliery engine builder, and in 1814 he built his first locomotive for the Stockton and Darlington Railway Line. Stephenson was hired as the company engineer and soon convinced the owners to use steam motive power and built the line's first locomotive, the Locomotion. In 1825, Stephenson moved to the Liverpool and Manchester Railway, where together with his son Robert built (1826-29) the Rocket. Mallard is the holder of the world speed record for steam locomotives at 125.88 mph ( 202.58 km/h ). 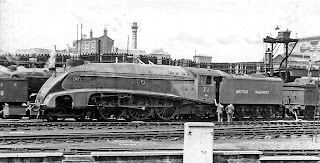 The record was achieved on 3 July 1938 on the slight downward grade of Stoke Bank south of Grantham on the East Coast Main Line, record of 124.5 mph ( 200.4 km/h ). Mallard was the perfect vehicle for such an endeavour. 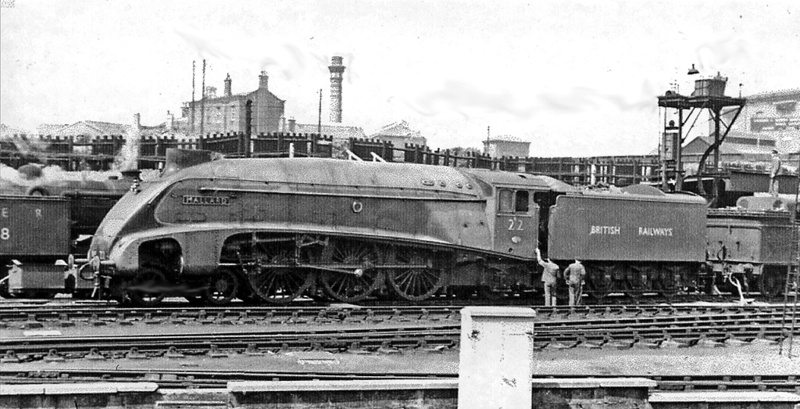 The A4 class was designed for sustained 100 mph ( 160 km/h ) running and Mallard was one of a few of the class that were built with a double chimney and double Kylchap blastpipe, which made for improved draughting and better exhaust flow at speed. The initial AGV ( Automotrice à grande vitesse ), design incorporated a number of new features: an electrically-activated active suspension (in the transverse direction to movement), used to limit oscillations between car and bogie; and eddy current brakes, fitted to the end bogies. Both technologies had been previously trialled on TGV sets. The carriages were constructed from aluminium alloy as used on the TGV Duplex. The interior structure was designed to allow easier refurbishment and alteration to the passenger environment. The floor level is kept practically constant throughout the train, including at inter-coach connections. The first design studies relating to the AGV were made in 1998. An AGV design, initially named "TGV 400" was presented in Barcelona in early 2000 as part of Alstom's bid to supply high-speed trains for the Madrid–Barcelona high-speed rail line. Initial specifications were for a train with distributed traction (total power 7.2MW), seating 359 in a train 180 metres long, with a version including eddy current brakes with a top speed of 350 km/h ( 220 mph ), and a tilting version with a top speed of 320 km/h ( 200 mph ). In 2007 a modified TGV Duplex, the 'V150', fitted with AGV-type bogies, traction electronics and traction motors set a new rail speed record of 574.8 km/h ( 357.2 mph ).